The man in charge of regulating Irish banks in the lead up to the financial crisis has apologised for insufficient regulation and supervision of banks. Patrick Neary was giving evidence to an Irish parliamentary inquiry into the causes of the 2008 banking crisis. He was appointed chief executive of the Financial Regulator in February 2006. He said he was “deeply sorry” that the measures his organisation took were “not sufficient to meet the challenges posed by the crisis and the recession”. Mr Neary told the inquiry that, with hindsight, the regulatory body he led “could have had more regard to the systemic risk that was accumulating in the banking sector and whether it was being adequately quantified and assessed”. Although he acknowledged failures in the regulatory system, he said the “primary responsibility resided with the banks themselves, who were best placed of all to assess their own risks and business models”. He said it was the boards of the banks who let their shareholders down. In his opening statement, Mr Neary said he had been employed by the regulatory body since its inception in 2003, starting off as its prudential director, before being promoted to chief executive three years later. He said the Irish Financial Regulator adopted a “principles led” approach to supervision which “essentially placed boards and management of banks at the centre of responsibility for the prudent conduct of business”. Mr Neary said this approach was followed by all EU countries. “The USA is the main proponent of rules-based regulation but this did not protect it from issues with Bear Stearns, Lehman Brothers, AIG, Wachovia and others,” he added. He said he agreed with earlier findings of Irish Central Bank governor, Patrick Honohan, when he said the Financial Regulator did not have the mix of skills necessary for a “more intrusive style of supervision”. Mr Neary said it was difficult to recruit experienced people to supervisory roles in the financial sector, because of the “constraints on salary levels available to public servants”. He said his organisation relied on the Irish Central Bank, which had greater resources and more staff, to “monitor and assess the overall health of the financial system”. The Financial Regulator, he said, was “obliged to follow” the Irish Central Bank’s economic and growth forecasts and therefore its decisions regarding the regulation of residential mortgage lending reflected the bank’s market assessments. “These predicted a soft landing and if that prediction had been fulfilled, there would not have been a banking crisis,” Mr Neary said. He said that prior to the financial downturn there were zero loan impairments in Irish banks. 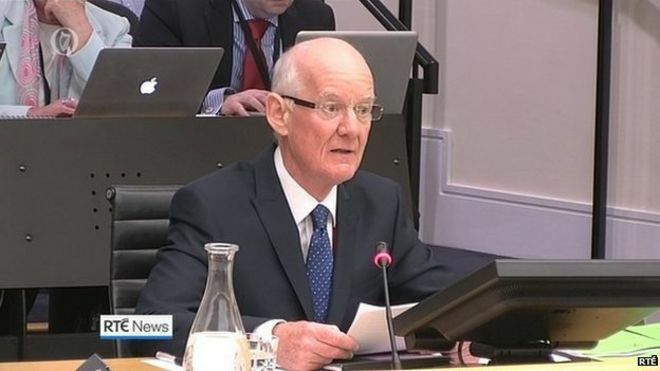 Under questioning, Mr Neary said he had no comment on the remark allegedly made by a former Allied Irish Bank (AIB) chairman that he was a “hopeless regulator”. Concluding his statement to the inquiry, Mr Neary said that he acknowledged, with the benefit of hindsight, that the “supervisory measures introduced by the Authority were not sufficient to meet the challenges posed by the crisis and the recession that emerged”. “I regret that very deeply,” he added.